Asthma is common in the primary care setting, affecting an estimated 1 in 9 Australians (AIHW 2017). Primary care providers are at the frontline of asthma management and play a critical role in disease diagnosis and management. It is increasingly important that primary care physicians recognise and assess for severe asthma. Severe asthma is defined as asthma which remains uncontrolled, despite treatable factors being addressed and maximal therapy being taken regularly (e.g. high dose inhaled corticosteroids, plus a second controller medication). A detailed definition of severe asthma is available here (link – https://toolkit.severeasthma.org.au/severe-asthma/definition/). Severe asthma directly affects between 3 – 10% of people with asthma based on international estimates (Chung, Wenzel et al. 2014, Hekking, Wener et al. 2015). The number of people in Australia with severe asthma is unknown. However, extrapolation of international estimates suggests between 52,800 – 176,000 Australians have severe asthma, representing a major clinical problem. Living with severe asthma has a substantial burden on people’s lives (Foster, McDonald et al. 2017). People with severe asthma experience frequent symptoms, may have difficulty maintaining work and often find that their social and family relationships are affected by their disease. These impacts are often under-recognised. Current clinical education resources and public health messages focus on mild-to-moderate asthma. However, severe asthma is increasingly recognised as a heterogenous disease, with specific management requirements (Pavord, Beasley et al. 2018). The Severe Asthma Toolkit website (https://toolkit.severeasthma.org.au) was developed by experts in the field for a broad clinical audience. The Toolkit is an independently-developed, open-access website to support optimised care for people with severe asthma. Diagnosis and Assessment: Requires a step-wise, systematic approach to 1) confirm a diagnosis of asthma and 2) assess whether asthma is severe. A checklist document has been developed to support this approach (link). Assessment requires a detailed patient history, the use of clinical questionnaires, objective documentation of reversible airflow obstruction and the use of additional diagnostic tools. 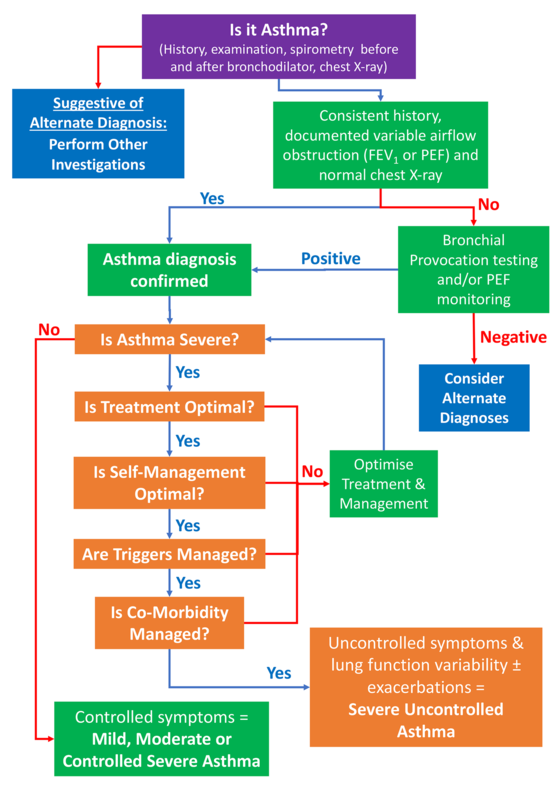 The following flowchart can guide the diagnosis and assessment of people with suspected asthma. Management: Treatment should begin with a discussion between the clinician and patient regarding shared goals and attitudes around asthma treatment. Self-management skills should be assessed and optimised in a primary care setting. Reviews should occur annually (at a minimum) and include asthma education, updating written action plans, addressing adherence and inhaler technique and the need for referral to specialist care should be considered. Medications: Treatment of mild-to-moderate asthma involves a stepped approach to medication usage, as outlined in the Australian Asthma Handbook. When severe asthma is diagnosed, treatment should shift to a targeted approach. This requires recognition that disease is heterogenous and individual patients require a personalised approach. Trials of add-on therapies can be considered and may require referral to a specialist respiratory / asthma clinic. New add-on therapies (e.g. monoclonal antibodies) are available that can reduce symptoms and improve quality of life for people with severe asthma (Grainge, Maltby et al. 2016). Comorbidity: Co-morbidities are common in the severe asthma population, are under-diagnosed and can worsen asthma outcomes. Importantly, assessment and treatment of co-morbidities can improve patient outcomes. Improvements include reduced asthma attacks, improved asthma control and improved quality of life (Clark, Gibson et al. 2017). Effective management may require referral to specialist care for diagnosis and treatment of comorbid disease (e.g. speech therapy for vocal cord dysfunction, sleep physician for obstructive sleep apnoea). Paediatrics and Adolescents: Children and teenagers die from asthma, and up to 80% of these deaths are considered preventable (Fitzgerald and Gillis 2015). Severe asthma is rare in the paediatric population and confirming a diagnosis or identifying a differential diagnosis can be time consuming. Children with ongoing asthma symptoms should be referred to a paediatrician with experience managing asthma. Adolescents and young adults (aged 14-24 years) have specific problems that need to be understood and considered. Disease management must consider the rapid physical, emotional, cognitive and social changes that occur during this life phase, and the impacts these factors have on asthma management. Resources: Practical resources are provided to support education (e.g. recorded presentations) and for use in the clinic, including clinical recommendation documents and assessment resources. Primary care providers are the first point-of-contact for people with severe asthma. Optimal care requires the initial recognition of severe asthma as a diagnosis. Patients with a probable diagnosis of severe asthma should be referred to specialist care. Effective management requires a systematic and multidimensional approach including face-to-face healthcare delivery and referral for appropriate specialist care. The Severe Asthma Toolkit is an evidence-based resource to support this approach. The Severe Asthma Toolkit (https://toolkit.severeasthma.org.au): Provides evidence-based educational content and practical resources for multidisciplinary health professionals caring for people with severe asthma. Australian Asthma Handbook (http://www.asthmahandbook.org.au/): Provides best-practice, evidence-based guidance for primary care health professionals, primarily focussed on mild-to-moderate disease. 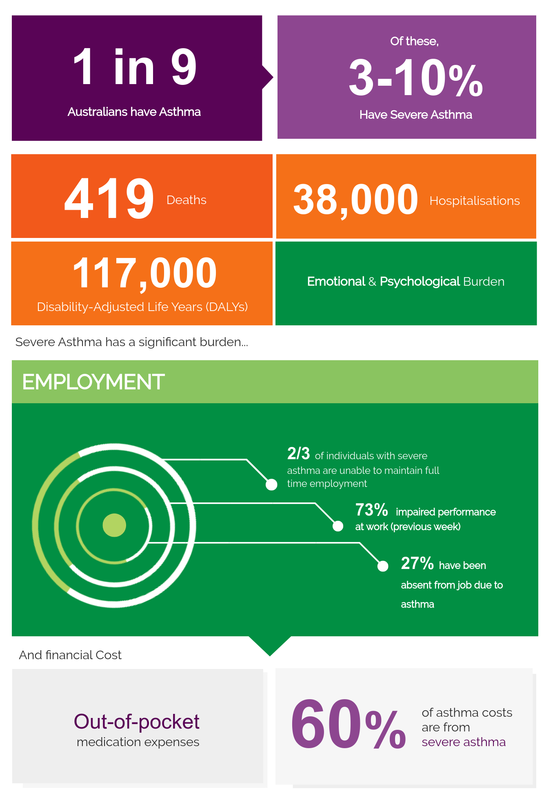 Asthma Australia – Severe Asthma (https://www.asthmaaustralia.org.au/wa/about-asthma/severe-asthma): Provides information on severe asthma targeted at a patient audience. Funding Information: The Severe Asthma Toolkit was funded by the Centre of Excellence in Severe Asthma, which is funded through the Australian National Health and Medical Research Council (NHMRC) Centre of Research Excellence programme. The Centre of Excellence has no commercial/industry interests. The full contributors list is available on the Toolkit website. All contributors are active clinicians and/or researchers and provided content free-of-charge. AIHW. (2017, 20/6/17). “Asthma snapshot.” Retrieved 08/11/17, from https://www.aihw.gov.au/reports-statistics/health-conditions-disability-deaths/asthma-other-chronic-respiratory-conditions/overview. Chung, K. F., S. E. Wenzel, J. L. Brozek, A. Bush, M. Castro, P. J. Sterk, I. M. Adcock, E. D. Bateman, E. H. Bel, E. R. Bleecker, L. P. Boulet, C. Brightling, P. Chanez, S. E. Dahlen, R. Djukanovic, U. Frey, M. Gaga, P. Gibson, Q. Hamid, N. N. Jajour, T. Mauad, R. L. Sorkness and W. G. Teague (2014). “International ERS/ATS guidelines on definition, evaluation and treatment of severe asthma.” Eur Respir J 43(2): 343-373. Clark, V. L., P. G. Gibson, G. Genn, S. A. Hiles, I. D. Pavord and V. M. McDonald (2017). “Multidimensional assessment of severe asthma: A systematic review and meta-analysis.” Respirology 22(7): 1262-1275. Fitzgerald, D. A. and J. Gillis (2015). “Asthma deaths in children in New South Wales 2004-2013: Could we have done more?” J Paediatr Child Health 51(11): 1127-1133. Foster, J. M., V. M. McDonald, M. Guo and Helen K. Reddel (2017). ““I have lost in every facet of my life”: the hidden burden of severe asthma.” European Respiratory Journal 50(3): 1700765. Grainge, C. L., S. Maltby, P. G. Gibson, P. A. Wark and V. M. McDonald (2016). “Targeted therapeutics for severe refractory asthma: monoclonal antibodies.” Expert Rev Clin Pharmacol 9(7): 927-941. Hekking, P. P., R. R. Wener, M. Amelink, A. H. Zwinderman, M. L. Bouvy and E. H. Bel (2015). “The prevalence of severe refractory asthma.” J Allergy Clin Immunol 135(4): 896-902. Pavord, I. D., R. Beasley, A. Agusti, G. P. Anderson, E. Bel, G. Brusselle, P. Cullinan, A. Custovic, F. M. Ducharme, J. V. Fahy, U. Frey, P. Gibson, L. G. Heaney, P. G. Holt, M. Humbert, C. M. Lloyd, G. Marks, F. D. Martinez, P. D. Sly, E. von Mutius, S. Wenzel, H. J. Zar and A. Bush (2018). “After asthma: redefining airways diseases.” Lancet 391(10118): 350-400. FOAM4GP Map – To Statin or not to Statin? – That is the question. ← Are you the effing doctor? !